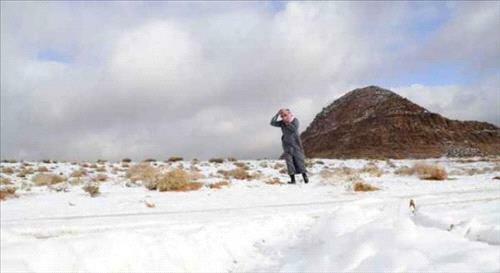 AMMONNEWS - The Kingdom will be affected by a chilly air mass accompanied by a polar depression centered over northern Syria, pushing temperatures down and creating bitter and cloudy conditions with scattered rain in the northern areas, the Jordan Metrological Department (JMD) said. In the afternoon, rainfall is expected across the country. that might turn to be heavy accompanied by thunder and hail causing floods in valleys and low lands. Snowfall is forecast at night mainly in the hilly areas located 900 meters above sea level, while winds will be westerly to brisk with speed reaching 50-60 kilometers per hour and strong gust exceeding 80 Km/h, blowing dust in the desert areas and causing low visibility, the JMD noted. Bitter cold and partly cloudy weather will continue to prevail on Thursday with a chance for scattered rain accompanied by hail at times in the western areas, while winds will be northwesterly brisk with strong gust reaching 60 Km/h. Clouds will gradually decrease in the afternoon as the weather will start to stabilize, the JMD further said. Frost formation is also expected Thursday night, as temperatures will further plummet mainly in the highlands and the Badia regions, JMD added. Mercury levels will rise few degrees on Friday, but cold conditions with clouds and northwesterly moderate will continue to prevail, the department noted. Daytime temperatures expected for today in Amman will reach 9 degrees Celsius, 8 in the northern governorates and 4 in the southern cities, dropping down to 2, 3 and 0 degrees respectively. The weather will be warmer in the port city of Aqaba with highs reaching 20 degrees Celsius and lows standing at 9 at night, the JMD added.